In a new report, Texas Comptroller Glenn Hegar says the state should cover 40 percent of the cost of public education — and should cover the costs of inflation, too. The state of Texas is paying 36 percent of the cost of public education while local school districts — funded by property taxes — pay the remaining 64 percent, according to a new report from Texas Comptroller Glenn Hegar. That’s a less rosy assessment than those offered by the Texas Education Agency or by the Legislative Budget Board, each of which has put the state’s share at about 40 percent. And it’s a benchmark from the state’s chief financial officer at the beginning of a legislative session in which the governor and legislative leaders have made school finance and property tax relief their top priorities. Three weeks into the 20-week legislative session, those leaders have not yet introduced legislation spelling out their specific goals — whether their aim is to level the state-local share of education spending; to rework formulas for spending on students who are relatively easier or harder to educate; to lower property taxes and/or limit future increases; to raise teacher pay; to introduce merit pay for educators, schools and school districts; or some combination of those things. That would mark a new way of doing things; under the current system, the state can spend less if — because of rising property tax revenue — the local districts are bringing in more money. Hegar’s idea wouldn’t let the state slide below 40 percent of the total, no matter what. And the report points out that the school funding formulas don’t have automatic adjustments for inflation. “While both state and local per-student funding rose greatly between fiscal 2000 and 2018, for instance, after adjustment for inflation state funding actually fell,” the report said. That’s a subtle way to throw a brick through the window; adding inflation to the state’s responsibilities would take a lot of financial pressure off of local taxpayers — at the state’s expense. The comptroller’s office is taking issue with the way the Legislative Budget Board and the Texas Education Agency measure state and local taxpayers’ contributions to public education costs. The budget board’s pesky chart doesn’t include all local taxes raised for bond issues in its calculations, leaving out those that aren’t required under state programs for school facilities. The TEA’s numbers include that but also count money “recaptured” from local school districts as state money, not local money. All three methods make the state out to be a bandit; the comptroller’s version is harshest, putting the state’s share of public education costs at 36 percent and the local school districts’ share at 64 percent for the 2018 fiscal year. The TEA’s is easiest on the state, putting the ratio at 39.9 percent to 60.1 percent; the budget board’s puts it at 59.9 percent to 40.1 percent. On average, the comptroller’s report says, the state has covered 40 percent of public education costs and the local school districts have covered 60 percent. The low point of the last 18 years was in 2006, when the state put up 30.5 percent of the money for public education and local districts carried 69.5 percent of the weight. And his numbers challenge the idea that the last school finance reforms balanced the state and local shares. It changed them, but it didn’t balance them, according to Hegar’s numbers: In 2007, the state/local share was 37 percent to 63 percent; a year later, the swing was big, to 46.2 percent to 53.8 percent. That’s as good as it ever got between 2000 and 2018, according to Hegar, who was a member of the Legislature at the time. “I did not appreciate that the minute we walked out the door, the shift of costs [back to local districts] began immediately,” he said Thursday. The budget board and TEA calculations have fueled most recent debate about school finance. In the budget board’s charts, the state share rose to 48.5 percent in the 2008 fiscal year; TEA had the state at 49.3 percent. Those agencies have been at odds. 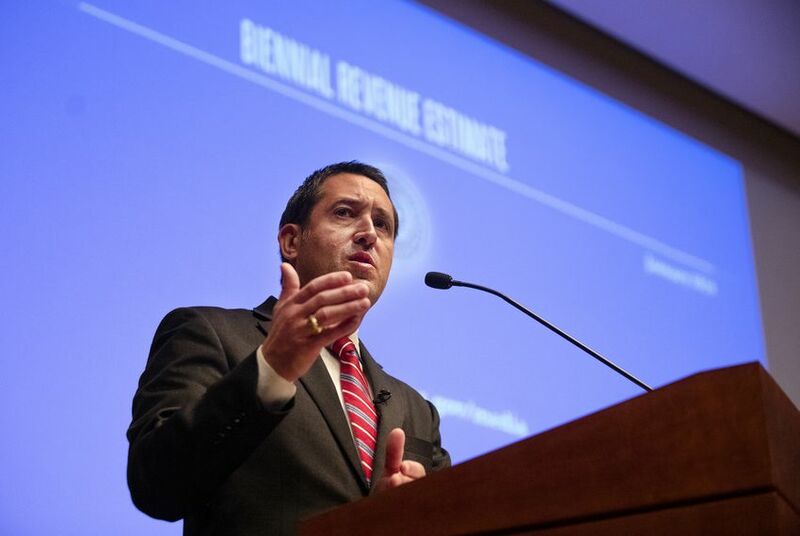 The budget board is controlled by the Legislature, the TEA is headed by appointees of the governor; Hegar’s numbers offer up a third-party take on spending. That sounds like inside baseball, but this is one of those budget situations where small differences mask large dollar amounts. Texas lawmakers appropriated $60.5 billion for public education in the 2018-19 budget, or about 28 percent of the $216.6 billion total. In that budget, the budget board was saying, in essence, that local schools outspent the state by about $12 billion. The TEA put the difference at about $12.2 billion. The comptroller says it was closer to $17 billion. Small-seeming percentage differences, large dollar amounts. By those rough back-of-the-envelope numbers, the 40 percent to 60 percent state/local ratio that Hegar suggests would require the state to put up $5 billion more — and that’s before any accounting for inflation, school population increases and fast growth that has some of the state’s districts scrambling to build facilities for new students. It’s just a starting place, but it tells lawmakers and voters where they are — and where to look for the results after the Legislature does whatever it’s going to do with school finance and property taxes. Analysis: You can't fix Texas school finance until you agree on the meaning of "fix"